Alan Reiach and Stuart Renton, 1960-62. Single storey, square-plan church, with hall adjoining to NE, linked to manse. Steel-framed, facing brick, with part timber-cladding. Continuous horizontal band of clerestory windows below eaves to church. Horizontally-boarded profiled metal fascia to church, hall and manse. Steps up to paved entrance level open courtyard. Marked concrete bell tower. TOWER: open-framed, 4-stage bell tower, with vertical timber slatting to upper stage. NE ELEVATION: predominantly blank, with deep band of clerestory windows; projecting entrance block to outer left, part-glazed; projecting block to outer right linking to hall (see below), comprising covered walkway to right of centre, remainder with predominantly tripartite glazing. SE ELEVATION: predominantly blank, with clerestory lights dropping to lintel height of door to outer left at ground; coped, whitewashed brick wall projecting from outer left, with large wood and metal cross on SE face. Predominantly metal-framed windows. Flat roofs. INTERIOR: lit by continuous clerestory, with roof, apparently 'floating'. Norwegian quartz aggregate pulpit and reading desk; teak communion table and font; Baltic redwood pews and ceiling. Original timber organ console, pipes and frame in situ. HALL: single storey church hall, parallel with and linked to church (see above); advanced vertically-boarded timber-clad SW entrance block elevation, with central doorpiece and symmetrical small light fenestration; predominantly blank SE elevation, with part-glazed NE return to projecting end of entrance block, door to left of centre at ground, coped chimney to re-entrant angle; predominantly blank NE elevation with deep band of clerestory windows, manse (see below) adjoining to outer right; NW elevation not seen, 2000..
MANSE: single storey, predominantly L-plan manse adjoining hall (see above). Kildrum Parish Church is a striking landmark in the new town of Cumbernauld. 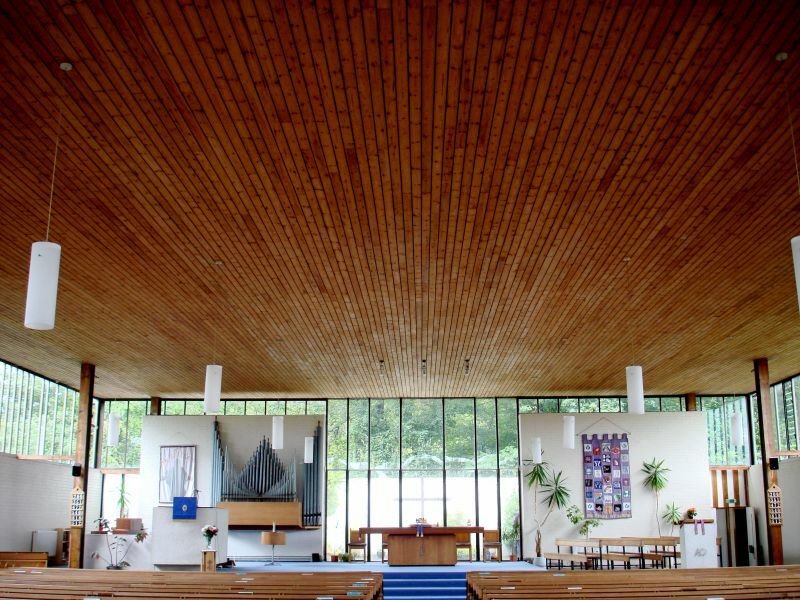 The Church of Scotland commissioned two churches from Alan Reiach for Cumbernauld, and, like Kildrum, the other church, St Mungo's (see separate listing), seats 800 and succeeds in creating a particularly well-lit interior. Both are clearly influenced by the new Scandinavian church designs that Reiach so much admired (see Eero Saarinen's various chapels, and Magnus Poulsson's Grauberget Village Church, Norway, 1955 and there is also a suggestion that the building was inspired by a church in Milan, Italy). An example of this influence would be Kildrum's chancel cross set within a walled garden, and separated from the interior of the church by a wall of glass. Reiach (1910-92), who was apprenticed to Sir Robert Lorimer (1864-1929), was primarily involved in the design of public buildings, including churches, schools, universities and hospitals.